One of my loyal readers asked me why I keep spotlighting strong stocks when I am more apt to go short right now. Fair question. The reason is, at the moment, it is easy to find stocks to short. If I were to throw darts at a board with the 7,000 stocks I track, there’s probably about a 75 percent chance I’d hit a stock that looks like a good short. It’s much tougher to find strong stocks right now. Why focus on strong stocks? One, it’s good to have a hedge when taking alot of short positions. Two, I need to be ready if this dip proves to be a garden variety correction. The stocks that have held up well are likely to skyrocket if the bull market continues. 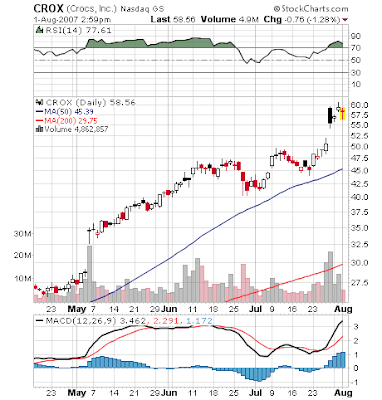 So here’s another strong stock, Crox. Nice breakout that has held up thus far. so you suggest to buy CROX now?